CXRacing Front Mount Intercooler + Piping Kit For. 99-05 VW Jetta 1.8T Turbo. Intercooler + Bracket + Piping + Silicon Hose + T-Clamp. This is CXRacing's New FMIC kit Developed From Ground Up, Replace Restrictive Factory Small Side Mount Intercooler. 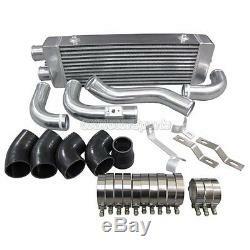 With this Intercooler kit, Intake Temperature is lowered, and much better pulling capacity. Kit is designed with bolt on fitment comes with brackets for pipes and intercooler, Sensor flange is bolt on for Factory Temp-Sensor. Intercooler: Core Size: 22"x8"x3.5" Overall Size: 29"x8"x3.5" 2.5" Inlet & Outlet One Side 3.5" Thickness Core, Bar and Plate Design. 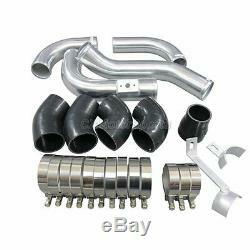 Piping Kit: Mandrel Bent Aluminum Pipe Comes with Silicon Hoses, and T-Bolt Clamps. Especially Designed, Made for the Application Stated. Fully Tested, Simple Easy Installation. One of the Best Kits on the Market, with High Quality Products and Affordable Pricing. This Kit fits GLI model with lowered Lip. For other model, Bumper Lip is Higher and can't fit the intercooler if keeping Bumper Bar. This Kit Comes with Black Hoses. Specially Desinged Brackets Securely Hold Pipes and Intercooler. Cold Intake Pipe, NOT Included. We sell our products internationally. PR, Guam, VI, AK , APO, HI. The item "CX Bolt-on Front Mount Intercooler Piping Kit For 99-05 VW Jetta 1.8T GLI Black" is in sale since Tuesday, November 1, 2011. This item is in the category "eBay Motors\Parts & Accessories\Car & Truck Parts\Turbos, Nitrous, Superchargers\Turbo Chargers & Parts". The seller is "cxmotorsports" and is located in Temple City, California.